Developer and operator SES Spar European Shopping Centers presented the progress of the construction project at a press conference on Tuesday, 9 April 2019 in Ljubljana and revealed the name of the center. The total investment amounts to approximately 150 million euros. SES is still recognized as the market leader when it comes to large-area shopping centers, both in Slovenia and Austria. SES envisions the future of shopping centers in multi-purpose areas that not only combine shopping, but also bring together culinary delights, leisure time activities, socializing, and culture. This is the concept of the most modern center, Aleja, which spans three floors and a 2-level underground parking garage. This will be SES’s fifth shopping center in Slovenia. The center will create approximately 700 new jobs. The new mall will offer shops, restaurants, and services combined with a special leisure program on a total leasable area of 32,000 sq m.
Aleja’s facade will be a true pinnacle of architecture as it will be constructed with specially treated steel that resembles the scales of a dragon, which is the symbolic creature found on the coat of arms of the City of Ljubljana. When planning its shopping centers, SES always takes regional aspects into account. The shopping centers, thus, merge even more closely with their locations. The same is true for the name. The name ALEJA is closely linked to Šiška and the future orientation of the center: an urban avenue, an urban meeting place that offers visitors relaxation opportunities and a space to stroll in the green heart of the Šiška district. Architecture firm ATP architekten ingenieure has been commissioned to carry out the general planning. 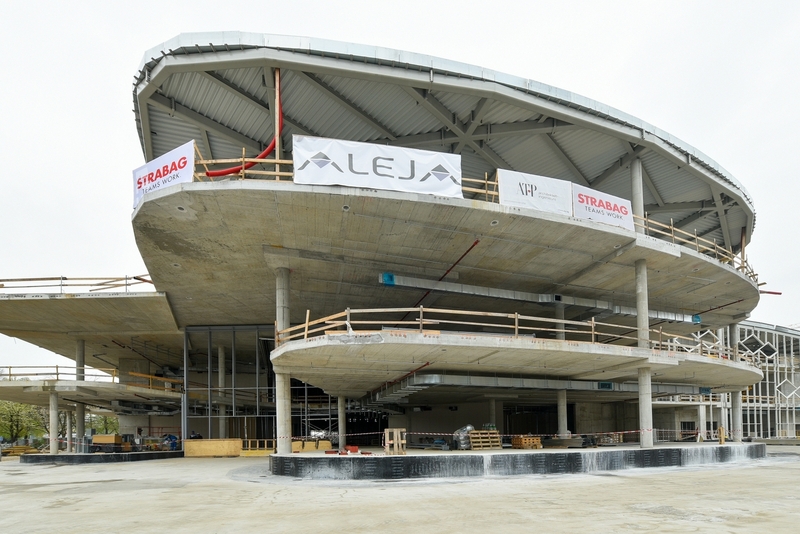 Aleja will bring 80 new stores of various brands to Ljubljana-Šiška: the most modern INTERSPAR hypermarket in Slovenia, drugstore Müller, technical retailer Big Bang, fashion by XYZ and H&M, and stores Hervis and MASS. The center will also provide a “home” for several recognized brands, such as Calzedonia, Max&Co., s.Oliver, Black Label, Comma, Tommy Hilfiger, Pandora, Intimissimi, SuperDry, and Buzz. It will also introduce Sport Vision as a completely new brand in Slovenia. On the panorama level of ALEJA, there will be a high-quality and varied gastronomic offer. An attractive food court will offer a variety of service restaurants and a wide range of fast food on over 2,300 sq m of leasable area. Visitors will be able to enjoy themselves in daylight ambience thanks to a huge glass dome. The catering area will include a large outdoor terrace for all restaurants and joints. As a result, the food court will be directly connected to the inviting sports and leisure activities offered on the roof. The Activity Roof will satisfy every wish of sports enthusiasts and families on a total area of 6,200 sq m. It will include a volleyball and basketball court, a football field, a fitness park, a running track, and an outdoor playground. The Activity Roof will be true to the “running over the city’s rooftops” motto. A pump track circuit for bikers – the newest sports trend – will be located immediately in front of the ALEJA center. The first Planet Lollipop in Slovenia, which will span over 500 sq m within Aleja, will be the largest covered children’s adventure world at a Slovenian shopping site. The trademark Planet Lollipop was developed by SES for our youngest visitors, ranging from the age of three and older. For many years, SES has operated Children’s World of Experience under the Planet Lollipop brand at seven SES shopping center locations in Austria with great success. The children’s adventure world at ALEJA will also be characterized by child-friendly equipment, high-quality care, and first-class materials. Separate rooms for celebrations and children’s birthdays will also be available.